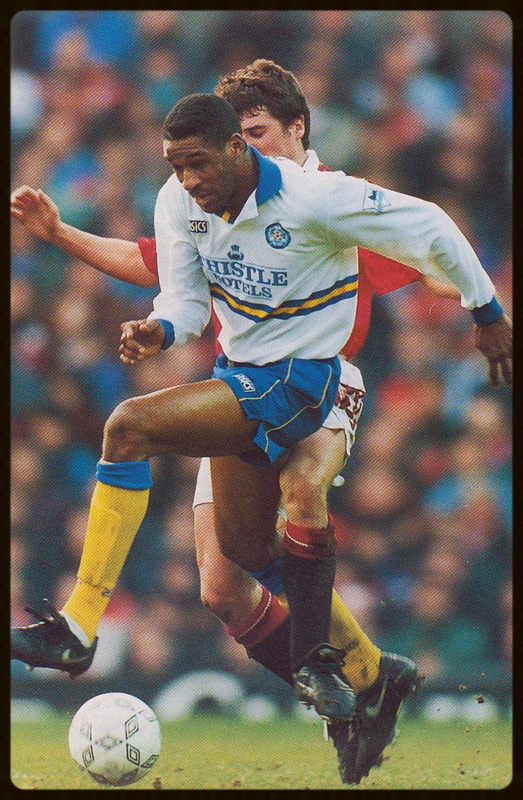 Centre-forward, Brian Deane enjoyed a career which spanned 21 years, saw him play for nine different clubs across three different countries; he had three spells at Sheffield United and two spells across Yorkshire at Elland Road. In 1985, it was Doncaster Rovers who gave Deane his big chance in football. He was handed his debut as a 17 year old in the old Third Division by manager Dave Cusack and three years later he signed for Sheffield United where he struck up a lethal partnership with Tony Agana and the pair fired The Blades to successive promotions. Deane’s last season, of his first spell, at Bramall Lane was the 1992-93 season. It was the inaugural Premier League season and the name of Brian Deane will be forever etched in the record books as the scorer of the new competitions first ever goal. Leeds, the previous season’s champions, suffered a torrid campaign. Wilkinson’s men failed to win away from home in the league and the manager knew he had to make changes. “In all honesty I never asked to leave Sheffield United, I felt that I was part of the furniture, but the club probably needed the money and the deal was too good for them to turn down. “I was delighted to score on my debut and it lifted some of the pressure on me but in all honesty I found that first season tough going and I didn’t hit the net as often as I would have liked. “I can’t speak highly enough of David Rocastle, he was fantastic for me. ‘Rocky’ kept me going at times and helped me through a difficult period. It was a real privilege to be around the man and despite his own frustrations of not being in the side, he always had a smile on his face. He was a shining light around the club and nobody had a bad word for him." After opening his account on his debut, ‘Deano’ found the net in a 2-0 win at Southampton as Leeds broke their away day hoodoo, but it wasn’t until the 6th of November that he bagged his first at Elland Road when he opened the scoring in a 4-1 rout of Chelsea. “Ironically it came at the Lane. I put us 2-0 up that afternoon but we couldn’t hold on and the game ended in a 2-2 draw. It was nice to go back there and score but more of a relief that the drought was over. “I didn’t mind, I was happy to be playing and it was a real pleasure to play with Tony. He was world class and at times defenders could not get near him. On his day he was the best striker in the world. Look at the goals he scored whilst at Leeds – the ones against Liverpool and Wimbledon were out of this world and obviously the hat-trick in Monaco. “We operated a different system and I was no longer playing with my back to goal, I was looking at the ball ahead of me. "I had some great strike partners during my career. Tony Agana and I struck up an unbelievable partnership. There was Rod Wallace and Nuno Gomes but Tony’s right up there with Alan Boksic as the best that I ever played alongside. “I’ll never forget that afternoon and that goal. Of all the goals I scored in my career that one ranks as one of my favourites. “During the season I realised that I had stopped doing some of the things that had made me the player that I was so I got my head down and worked hard. I looked at the goal as my reward; it was the icing on the cake. “We beat Manchester United at home on Christmas Eve. We could’ve competed with any side that day and we fully deserved the 3-1 win – everything we worked at on the training ground came off and it gave the fans a very happy Christmas. “Tomas Brolin had arrived at the club and the fact that he struggled to make an impact has been widely documented before now but he was immense that afternoon and his star qualities shone through. “I suffered a rather painful injury against Derby County on the first day of the season and by the time I had returned to the side, Howard had been sacked and George had been appointed as his replacement. “I got on well with George; he was old school, a disciplinarian. He had no favourites but gave me a lot of responsibility. He would often tell me that he was looking for a big performance from me and I thrived on that. “At the end of the season, I decided to move on, Leeds had offered me a new deal but I didn’t think it reflected my true worth. I had offers from abroad, which I considered, but decided to return to Bramall Lane. “I loved my time at Leeds, we had some great characters. I’ll never forget an incident in Marbella whilst we were over there on an end of season trip and the Liverpool lads were there at the same time. “Gary Kelly had found a cheeseburger on the street near Lineker’s Bar and was stood there holding it in his hand. Jamie Redknapp came strolling past and asked ‘Kells’ for a bite of his burger to which he didn’t hesitate. Redknapp took a huge bite and commented how nice it was before he was informed, by Kelly, that he’d just picked it up off the floor! “I was out of contract at Upton Park and Leeds were rebuilding due to the financial problems that had culminated in relegation. “Kevin Blackwell offered me a deal to return and I relished the opportunity. I felt I could make a real impact and help the younger, less experienced lads but in all honesty it didn’t work out as I had hoped. “The lads stuck together and gave their all, but admittedly, some found it very difficult and couldn’t handle the situation. The expectation was huge and despite the trauma’s there were still 30,000 coming through the turnstiles. ‘Kells’ was still there and he and Michael Duberry led by example. Gary was Leeds through and through and he had the respect of everybody inside the place. “It was fantastic to be honest, an afternoon I’ll never forget. To score a hat-trick at Elland Road was amazing but to get four was something else. My only regret is that I didn’t take the penalty which David Healy missed! Thank you to Brian Deane for his time and giving me the opportunity to write this article.